Once my kids were born, I felt this overwhelming need to start reading all the labels on the food I’d feed to my children. Cooking all of a sudden became a bigger priority—before they came along, takeout was a regular occurrence in our household, but with children in the picture, I tried to incorporate wholesome ingredients into their meals whenever possible. It became a bigger deal when my kids started getting really picky about what they wanted to eat. I had to get a little crafty, transforming traditional recipes into super healthy and energy-boosting variations. Making healthy subs in recipes that my kids approved of often only requires a few minor substitutions. My kids pick apart their food like hawks—if there’s a speck of green where it shouldn’t be, I’ll never hear the end of it. Although they don’t realize it, our children rely on us to provide them with wholesome foods and to start them off on their culinary journeys with an appreciation for a variety of foods and a developed palate. If you do it right, they will become accustomed to a diet filled with tasty, healthy foods. 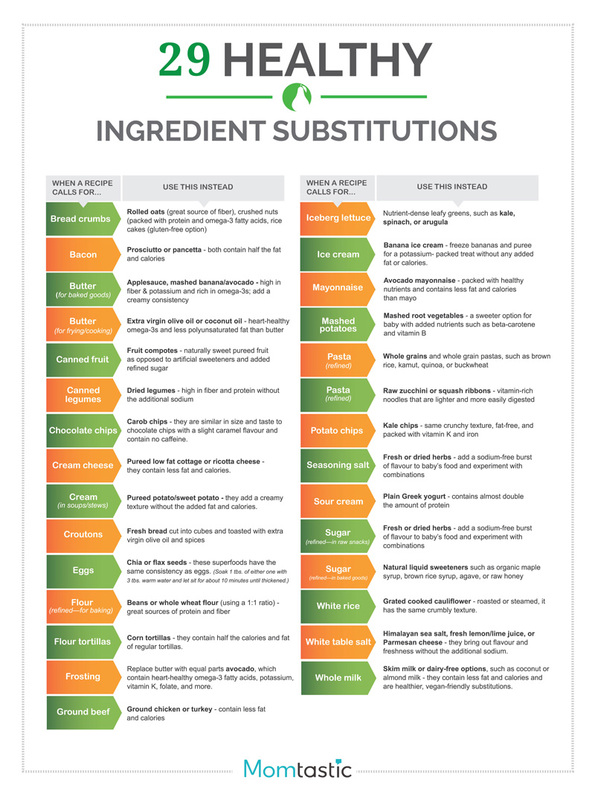 Here are some healthy, easy-to-make healthy ingredient substitutions that can be made on a daily basis to ensure you provide healthier options for your family. Even if you’re at that stage where you can only make pizza every night for dinner or else, this list will help you pack the most nutrition into your kids’ meals. Prosciutto or pancetta—both contain half the fat and calories. Carob chips—they are similar in size and taste to chocolate chips with a slight caramel flavour and contain no caffeine. Pureed low fat cottage or ricotta cheese—they contain less fat and calories. Pureed potato/sweet potato—they add a creamy texture without the added fat and calories. Corn tortillas—they contain half the calories and fat of regular tortillas. Replace butter with equal parts avocado, which contain heart-healthy omega-3 fatty acids, potassium, vitamin K, folate, and more. Banana ice cream—freeze bananas and puree for a potassium-packed treat without any added fat or calories. Grated cooked cauliflower—roasted or steamed, it has the same crumbly texture. White table salt Himalayan sea salt, fresh lemon/lime juice, or Parmesan cheese—they bring out flavour and freshness without the additional sodium. Skim milk or dairy-free options, such as coconut or almond milk—they contain less fat and calories and are healthier, vegan-friendly substitutions.